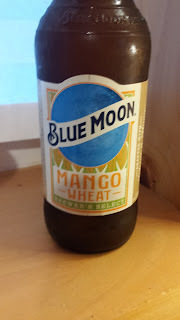 This week's Sunday Night Suds looks at Blue Moon's Mango Wheat Ale. The Mango Wheat Ale is Blue Moon's special limited edition in this summer's Brewer's Select mix box. It is not easy to find as I can't even begin to count the number of beer stores, convenience stores and supermarkets I looked for this in. I even asked the Ferro Bros of Beverage Barn of Garden City (my go to beer store of choice) to try to get me this summer's Brewer's Select mix box and they were incapable. I had given up hope of finding it when I stumbled across it in a Tops Supermarket in Norwich, NY. Although the Blue Moon Mango Wheat Ale is not the only kosher mango infused beer (see review of the Samuel Adams Rebel Juiced IPA here http://kosherbeers.blogspot.com/2017/07/sunday-night-suds-rebel-juiced-ipa.html) it is a superior brew and for my money the best new offering from Blue Moon since the Cappuccino Oatmeal Stout introduced in 2015. The Mango Wheat Ale has (obviously) mango overtones, but it is the right mix of sweet, reminiscent of their Honey Moon (see this oldie but goody review here http://kosherbeers.blogspot.com/2008/05/sunday-night-suds-blue-moon-honey-moon.html). There is decent carbonation, some hop bite, although not much in the way of pine. But the citrus melds with the mango to create a delicious summer refresher. Blue Moon Mango Wheat Ale is certified kosher by the Orthodox Union, as is every other current variety of beer produced by Blue Moon. For the experts take on this beer, please click here beeradvocate.com/beer/profile/306/271820.